1. 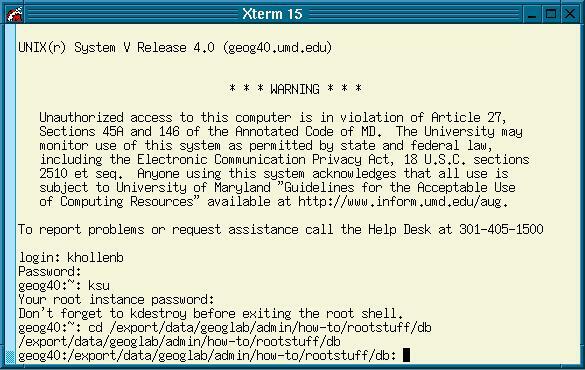 Login to geog40 remotely and become root. 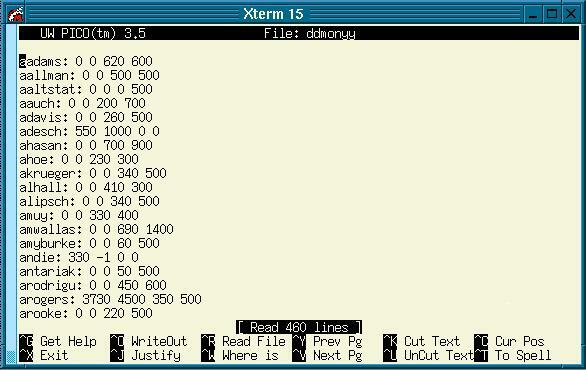 Pico is nice for updates since it has a search function (use control-w to find the user you're looking for) and it's plain text so it will work from a telnet window. d) The paid credit (the amount the user has paid directly for--receipts in receipt book). e) In the example below, aadams has paid for $6.00 of printing and has used $6.20 worth. She'll need to pay for the additional 20 cents in addition to any further print credit before she can print again. In comparison, adesch was given $10 of free credit due to his work as an FRA, and he has used $5.50 of that credit. f) The database automatically debits the free credit first and, at present, there is no way to tell the printer which credit to use. g) The -1 notation in the free credit column of andie's account tells the printer that she had unlimited usage (because she was part of the computing staff).